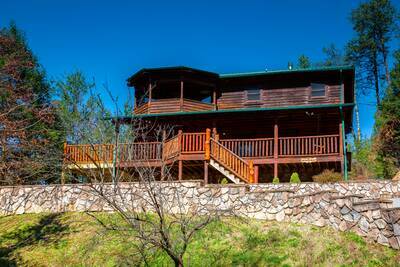 Welcome to Chalet a’ le Conte in Gatlinburg! 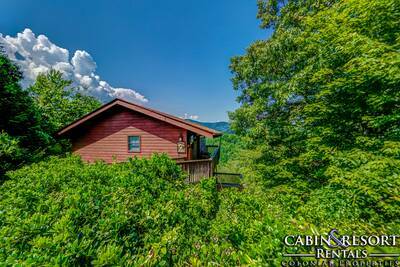 This phenomenal 3 bedroom, 3 bath Smoky Mountain vacation rental is definitely the place to spend your next vacation getaway! 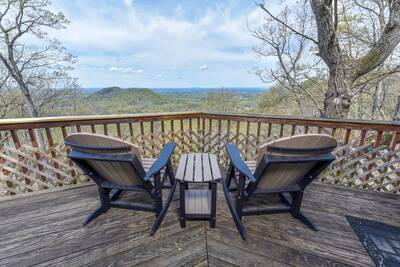 As soon as you enter this Gatlinburg rental, you are greeted in the living area wide by a wide window area that magnificently frames the view of the Great Smoky Mountains National Park and downtown Gatlinburg. The Ober Gatlinburg tram goes travels overhead near the deck area for excellent views of the tram, day and night. The comfortable living room features relaxing and upscale leather furnishings, 55” flat screen TV, main level deck access and a crackling stone accented gas log fireplace. Adjoining the living room is the fully equipped gourmet kitchen. With upgrades such as stainless appliances, under cabinet lighting and granite countertops, making a delicious meal while on vacation will definitely be a real treat. Nearby, you also have access to the custom kitchen island with bar seating for four people, with the kitchen and dining areas adorned with barn lights and beams overhead. Located on the main level of Chalet a le Conte is one amazing master bedroom. The bedroom has a luxurious king bed and custom headboard that features eclectic décor, flat screen TV, en-suite full bath with oversized shower, and double sinks. Venture down to the lower level of Chalet a le Conte and you’ll find the second living/game room area. This stunning living room features a 55” flat screen TV, surround sound and internet connectivity for streaming Netflix, cozy sleeper sofa, and access to the lower level deck, where you’re treated to rocking chairs, swing, patio seating, and a bubbling outdoor hot tub with views of the Smoky Mountains. Located just off of this living area you’ll find the wonderful recreation room. This fun-filled space offers a pool table plus a wet bar. It’s the perfect place to gather with friends and family for hours of entertainment and fun. 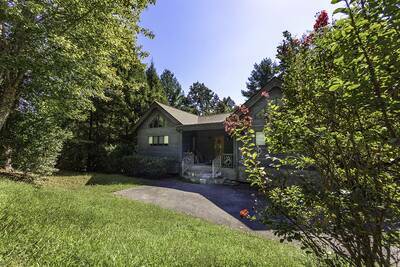 Down on the second floor of Chalet a le Conte, you’ll find two additional bedrooms. The first is a second master suite. This relaxing and beautiful bedroom provides you with a king bed, flat screen TV, and a luxurious en-suite full bath featuring a stone accented jetted tub, oversized shower, and dual sinks for added convenience. The second bedroom on this floor offers a comfortable king bed and a flat screen TV. There’s also a third full bath located nearby on this level as well. In case you need to do a little work, or just want to browse the internet while you and your guests are on vacation, Chalet a le Conte has complimentary high speed WiFi. 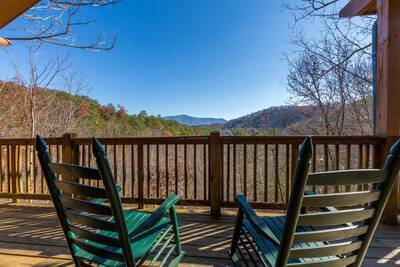 With it’s amazing views, perfect Gatlinburg location, wonderful amenities, fantastic features, and gorgeous décor, you and your guests will certainly have the vacation of a lifetime in the Smoky Mountains at Chalet a le Conte. In fact, from its deck, you can see Gatlinburg, Ober Gatlinburg tram, Gatlinburg Space Needle, and much more including Mt. Leconte. Reserve your stay here today! A: Hi Colleen, this cabin does have WiFi and seasonal pool access! A: Tammy, unfortunately it is not one of out pet friendly properties.